The effective combination of management training and senior management coaching helped increase understanding of leadership responsibilities and develop a sound strategic growth plan for a leading Midlands charity. Sport 4 Life UK started as a small community project in 2006, in Ladywood Birmingham. 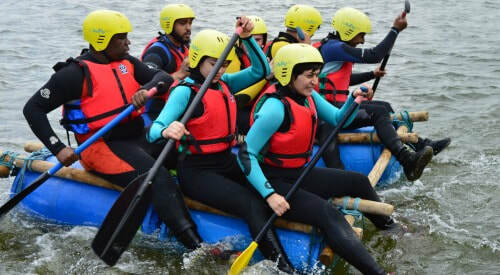 Since then under the leadership of co-founder and CEO Tom Clarke-Forrest the organisation has grown into one of the leading sport for employment charity's in the city with expansion plans for the UK. Their sports themed personal development programmes aim to bring out the best in disadvantaged young people, whilst also giving them mentoring and guidance. ​My introduction to Sport 4 Life UK was in 2015 when Operations Executive Matt Forsyth attended the "Introduction to Coaching" course I facilitate at BVSC. Matt was looking to widen his leadership style and found coaching a good additional tool to use with his dynamic staff team. Matt followed this up by attending my Delegation course, after which we got to talking. In 2016 we agreed that I would run a half day course on time management for all the staff. This was well received and I started regular informal conversation and advice with Tom and Matt. Early in 2017, Tom invited me to coach him to help explore and challenge his thinking on the next growth phase of the organisation. This was a stimulating and exciting process that helped Tom shape strategic proposals for his board and focus fundraising on high net worth individuals. As part of the expansion programme of the organisation a new group of management roles were created. Matt invited me to adapt and bring in-house, my unique management programme called "Just about Managing"; a combination of group training and individual coaching over a 3 month period. Six of the Sport 4 Life UK managers participated in the programme with a seventh who joined later attending the BVSC organised programme. All participants enjoyed the programme. ​Matt also reported an increase in his team's technical skills and, just as importantly, their confidence in being a manager. It also facilitated the start of the development of a common language and understanding around leadership and the responsibilities that come with management. The following training courses were used by Sport 4 Life UK. You can review my coaching packages as used by Matt and Tom here. "I have found Rob's "Just about Managing" programme extremely useful in my day to day job as project manager. He has helped me to understand different techniques that I can use to improve my management skills and has also helped me reflect on how I manage and ways in which I can improve my performance and ultimately be happy in my job and life. If you get the chance to read any of the books he recommends DO IT."